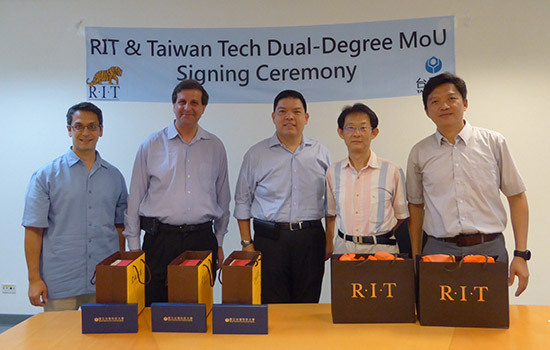 RIT expanded its academic and research collaborations with Taiwan Tech and signed an agreement for a new dual degree for graduate students from each university. Participating at the agreement signing are, from left, Matthew Wright, director of RIT’s Center for Cybersecurity; Andres Kwasinski, associate professor of computer engineering; Shanchieh Jay Yang, department head of computer engineering; Bohr-Ran Huang, dean of the College of Electronical Engineering and Computer Science, Taiwan Tech; and Jenq-Shiou Leu, department chair, Computer and Electronic Engineering, Taiwan Tech. Rochester Institute of Technology entered into a partnership with the National Taiwan University of Science and Technology, also called Taiwan Tech, to offer a dual Master of Science degree program. Students would receive a graduate degree in computer and electronics engineering from Taiwan Tech and a dual degree in computer engineering from RIT. This newest initiative expands the growing relationship with Taiwan and several of the country’s top universities. The dual degree program aims to broaden students’ international research experience through joint thesis advising. Research topics and coursework will center around the Internet of Things, cyber-security, data analytics, high performance computing and machine intelligence, said Shanchieh Jay Yang, professor and department head of computer engineering in RIT’s Kate Gleason College of Engineering. National Taiwan University of Science and Technology to provide an accelerated, five-year program for students to obtain a Bachelor of Science degree from Taiwan Tech and a Master of Science degree from RIT. Under the agreement, students would study for three years in Taiwan, earning a bachelor’s degree in electronic and computer engineering, electrical engineering, or computer science and information engineering. They would follow up with two years in the United States at RIT, receiving a master’s degree in computer engineering from RIT’s Kate Gleason College of Engineering. National Taiwan University entered into an academic agreement, the International Graduate Study Partnership Program. The agreement is to provide qualified students the opportunity for early and expedited admission into graduate programs in NTU’s College of Electrical Engineering and Computer Science and RIT’s Kate Gleason College of Engineering. Students from one institute would apply for admission in the fall of their last year of study and receive priority consideration for admission to the other institute’s Master of Engineering, Master of Science or doctoral degree programs. RIT is prepared to enroll up to 10 students from NTU’s College of Electrical Engineering and Computer Science. In addition to coursework, the meetings in Taiwan were to initiate discussions about expanding research collaborations between faculty and to provide international internship and co-op experiences for RIT undergraduate and graduate students. Yang, who has led several previous visits to Taiwan, traveled with Andres Kwasinki, associate professor of computer engineering in the Kate Gleason College of Engineering, and Matthew Wright, professor and director of the Center for Cybersecurity, part of the B. Thomas Golisano College of Computing and Information Sciences. Meetings took place at: National Taiwan University, National Chiao-Tung University, National Taiwan University of Science and Technology, National Ilan University and National Central University; at two research and product development laboratories, the Institute for Information Industry/Cyber Security Technology Institute; the Industrial Technology Research Institute and at the multi-national corporation Media Tech.